Well, this project went on forever. My friend suggested I try a honey pot to hold him up. that might just work as a honey pot. Unfortunately, a little glue is needed. A cute little ruffle, and tie. Hang tag with "Liberty" stamped on it. Voila! 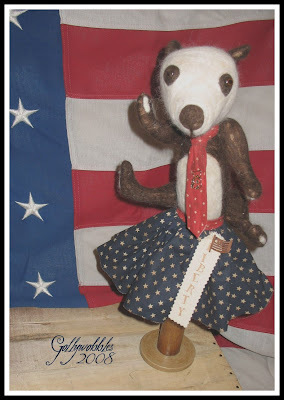 A patriotic bear makedo.